The Strathewen Bushfire Relief Company manages a communications system to contact subscribers via email and/or SMS regarding activities and events in the community and often request participation in survey’s regarding community matters. Your personal details are treated with the strictest of confidence and will not be shared with any third party. Your details will be kept private. Please note applications are for individuals only. Each member of a household who would like to subscribe will need to submit their own application form. Applicants must be 18 years or older. 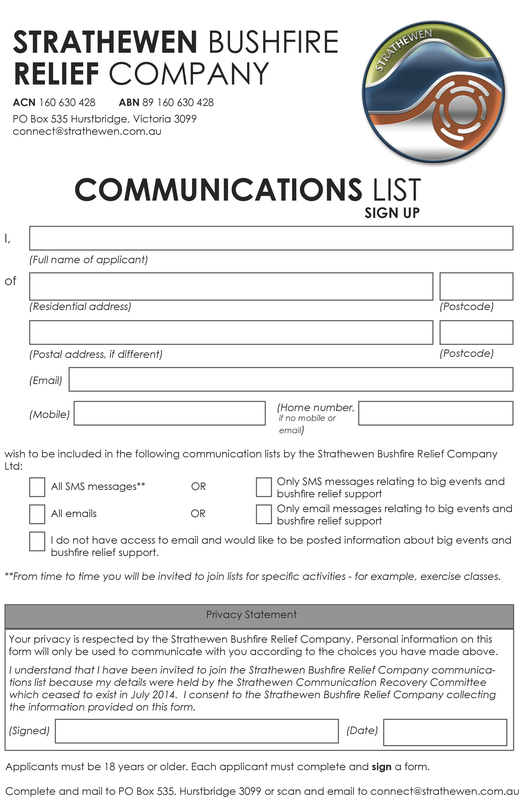 If you would like to subscribe to the Communications List please download the below form and submit to the Strathewen Bushfire Relief Company at PO Box 535, Hurstbridge, Victoria 3099 or scan and email.